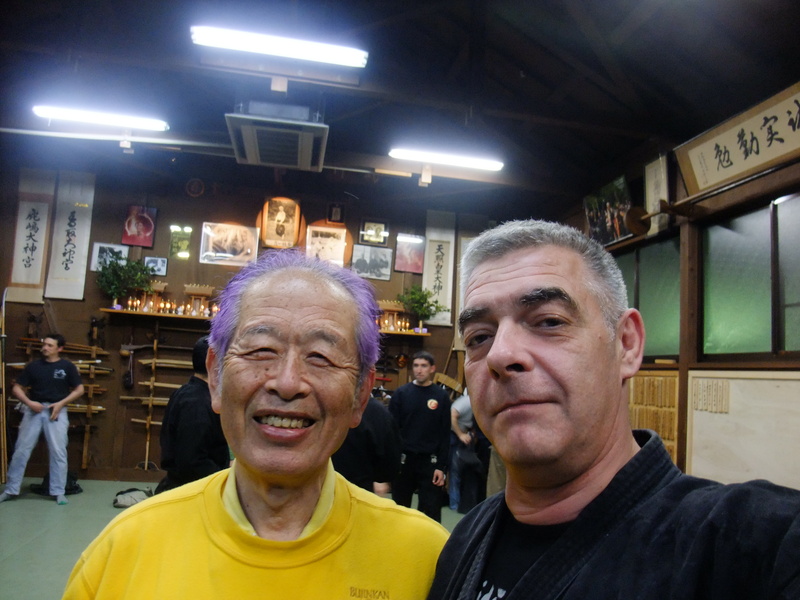 Tuesday has been another fantastic day in Tokyo as sensei asked me on Sunday to meet him with Pedro and Kogure san (Quest videos) at his place at 5pm before training. The light rain and the cold weather that accompanied me from Kashiwa to Noda didn’t lower my pleasure of meeting sensei and my buyu brother Pedro. When Pedro and I met in a Spanish Taikai more than 20 years ago we never suspected the particular tie that would bind us together during all these years. Even though I met Sôke at the London Taikai in 1987 (the first European Taikai in Europe organized by my other brother Peter King) and again in 1988 (Sweden Taikai organized by my other brother Sven), I want to thank Pedro again here to have introduced me to Sôke on my first trip to Japan. 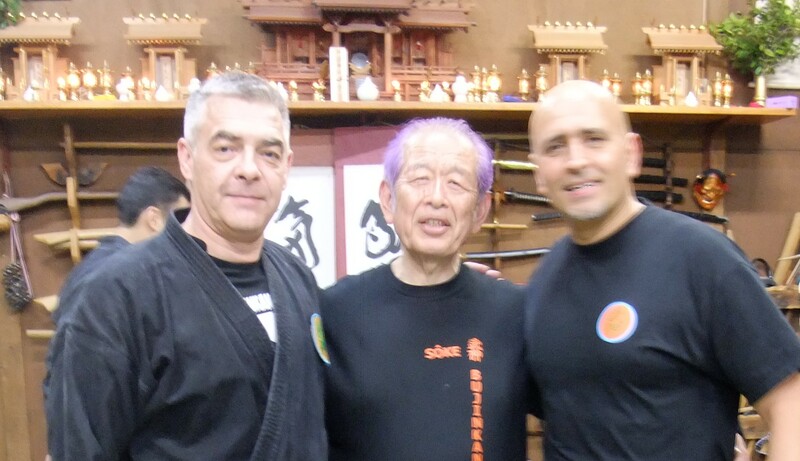 I think that without this special connection he has with our Sôke I wouldn’t have gone so far in the Bujinkan. Muchissimas gracias hermano! And thank you also to the true friendship of my older Yûro Shi Tennô brothers Sven and Peter. Anyway, at 5 pm Pedro, Miguel, Kogure san and myself met in Sôke’s house where he showed us some very rare documents including the original letter of surrender written and signed by Hiro Hito tennô and the 12 members of his government, the day before they officially surrendered. This document is so important that no financial value can be given to it. We also were honored to flip the pages of an history of the rulers of Japan realized for the tennô only with original ukiyoe print on a very special type of paper that resists all natural disasters so common to Japan: tsunami and earthquakes. A paper so special that a single blank page is worth 800 Euros… and they were more than 50 pages all printed with original ukiyoe… As a joke sensei said that this paper might be able to resist an atomic disaster… but was it a joke? He then showed us a 600 year old tachi (with a tsuka of 3 fists and a half). Our budô is definitely not a sport and these few items he displayed especially for us is the proof that without this kind of knowledge your martial arts abilities are only a “puff of smoke” as they say in the Shinden fudô ryû. 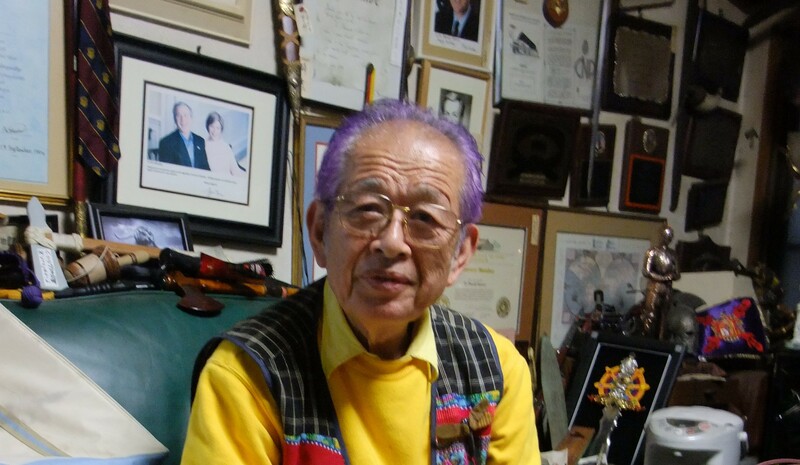 Sensei added that no Japanese were able to grasp that anymore, that this knowledge has disappeared today here in Japan and this is the reason why he is always referring to him as a “ufo” (since his first visit to the USA in the 80s). Japan has lost his history the forgotten the lessons it carried. To illustrate his point he told us that the technique to make the special paper that I spoke earlier of has been lost and that no one today in Japan knows how to do it anymore. This introduction of our meeting was an excuse for him to tell us that if someone with the proper knowledge, connections, and structured organization was existing, he would give away everything he had to save this knowledge from disappearing. As you know sensei’s house is like a real museum and those documents he showed are far from being the most important things he has. Sensei said he also had in writings the fours parts of the Amatsu Tatara being like the four parts of the hearts or the stomach and that even that was not the best piece of his collection of historical data. But the most amazing to me was that he insisted that he would never sell it but was ready to give it for free if someone worth it was presented to him. Even Kogure san was surprised by all this. This was indeed a very special moment and thanks to Kogure san translations into English and Miguel’s ability to speak and understand Japanese, the connection between all of us was very good. Then it was time for the class and we went to the Hombu where nearly 70 people were waiting for the class to begin. Senseis introduced the class by showing a special yari that he bought earlier on Tuesday on which a tube with hooks facing the tip is sliding on the pole allowing it to move faster when stabbing the opponent. It was another piece of historical teaching as sensei explained that when facing a weapon you have to understand the various (and sometimes illogical) ways of using it. In this particular case, he said that fisherman hooks known as hari (針) in Japanese could be attached to the sliding device in order to trap the skin or the yoroi of the attacker. The main point in his class was the following: “be aware of what you cannot see, what you can see is easy to deal with, what you don’t see is what is really dangerous”. He uses the term “mienai” (見えない)which something that one cannot possibly see (in opposition to the “kakushi” term – 隠し). His point was to make us aware of the risk of invisible radiations these days. We did many taijutsu and weapon techniques started by Pedro and Thomas and sensei insisted a lot on the importance for this year’s theme of the use of the fingers (Takagi Yôshin Ryû) to inflict pain in many different places. At one point we did a kind of ryô happa ken to the head changing rapidly the pain location by switching the intention from one finger to the other (below the jaw, above the ear, under the nose, inside the eyes etc). Another point is not to use strength so that uke is not able to use this strength of the hold to free himself from it. On a choke attempt he showed how to move our shoulders in different ways (up/up, up/down) in order to change the size of the neck a technique we did 20 years ago during a daikomyô sai in Japan and where we all looked like little neck less dwarfs rocking sideways. This neck hiding technique is very useful when applying a kikaku ken (headbutt strike) as the shoulders protect the vertebra. We also did a technique against a fist and kick (same side) attack in a kokû manner. The interesting point here was to apply the shutô to the attacking arm from inside at a 45° angle, then to receive the kick softly in the inside of the right elbow and sliding the body to the right to operate a kind of natural reversal of uke’s body by his trapped leg. Uke’s leg is captured inside your arm with your back to you and your hand can naturally grab uke’s belt. Sôke insisted on the importance of locking uke by the belt grab. Then sensei explained that we had to grab uke in the manner of an ice pick. The ice pick is hooking the ice but doesn’t go through it. From there uke is put down straight to the ground and locked there in pain by crushing his fingers with your fingers. This was the feeling we had to understand yesterday night. On the sword henka of the techniques initiated by Pedro and Thomas, he showed us again how to draw the blade (nuku, 剣を抜く) from the scabbard without pulling it the hand but by using the tsuba to hook the attacking hand (grabbing or not) of uke. Sensei said that this was a very old way of drawing that has been lost like many other things in Japan warfare knowledge. At one point speaking of the yoroi, he said that a samurai would have at least 3 sets of yoroi depending on the seasons and that the winter yoroi would be covered with bear fur in the inside of it. And that also is not known by many gendai budô experts. Actually he was so critical on the sword abilities of modern practitioners in Japan that the camera had to be turned off! We also did a very nice footwork technique where under a jodan kiri attack you do some kind of jûji aruki (not yoko aruki) turning your body nearly back to uke right side and rotating the blade (wrists are crossed) hitting uke directly in his attack. A very nice flow body flow quite hard to get in a crowded environment but saving a lot of space. After going back to Kashiwa I had a meeting with Kogure san and while we were having dinner a very long (more than a minute) and soft earthquake shook the whole building. It was like having the metro passing under the floor… but we were on the 6th floor. Strange feeling. As I said, another fantastic day in Japan indeed!